How Sustainable Is The Future of Mobile based eCommerce? 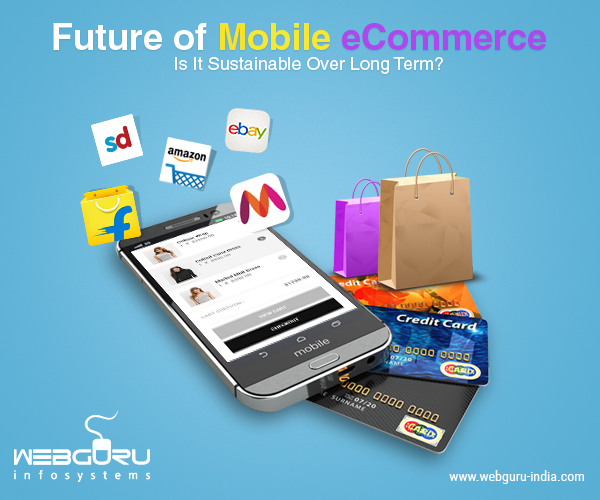 Future of Mobile eCommerce – Is It Sustainable Over Long Term? With the eCommerce industry flourishing rapidly, there is no denying the fact that it is here to stay. Why would someone prefer to visit a brick and mortar store to purchase a product when he can do the same right from the comfort of his home? Today, making purchases has become way easier, thanks to a ton of devices we have at our disposal. Big eCommerce giants, however, have come up with unique methods to drive conversions. Just as more and more people are switching from a bigger screen (say, a desktop or a laptop) to smaller ones on mobile phones, eCommerce sites like Flipkart, Amazon, etc tend to push their mobile apps a tad more. Until a few days ago, firing up your phone to visit the Flipkart mobile website would redirect you to download the app instead. Adding to this, Flipkart had ‘app exclusive’ offers for customers who are making purchases on their mobile devices. The sole reason for such targeting is to make eCommerce future proof on mobile devices. With people using their phones more often than laptops or personal computers, it is evident that the future lies there. And when you leave customers with no choice but to install an app every time they try to visit the website on the go, the app gets installed even more. There are plenty of benefits of using mobile eCommerce today. With smart phones entering every household as a necessity and more and more people using them for various reasons, it is no wonder that the eCommerce companies are investing humongous figures into their platforms. Have you ever had a moment when you wanted to buy something but could not find your debit or credit card to make the purchase? Guess what, that is now a thing of the past. Most smart phones use their native wallets or even fingerprint scanners to make online purchases. You can save your cards within your eCommerce account so that you would not have to go searching for the card number every time you wanted to buy something. One of the biggest benefits of using mobile eCommerce apps over their desktop counterparts is ‘push notifications’, which gives us a quick glimpse at the latest deals and offers without having to open the app. Another advantage of mobile eCommerce is portability. You can make a purchase any time you want, without having to sit tight in front of your laptop or desktop. No remembering passwords either as the mobile app does it for you. So is mobile eCommerce sustainable in the long run? Yes, without a shadow of doubt. Although it is up to the companies to raise the bar with newer features and more lucrative options for the customers, it goes without saying that people will be willing to accept mobile eCommerce as the norm going forward. As the trend continues to grow, the adoption rate for mobile eCommerce is bound to shoot up and soon enough there might be a time when people might actually stop going all the way to a store to buy products they can easily get right from their homes. It’s true that people use their phones more than their computers for online shopping these days. I think this is going to keep increasing in the long run. Your blog is really informative and highlights all the popular features of mobile ecommerce. This is Right, Because of Most of mobile users in india and other countries. I think Mobile eCommerce services is very useful to online shopping. thanks for sharing such nice information. This is a very true fact and for this growing market we are seeing google also giving huge import ants to the websites who are mobile friendly and responsive. In fact it is becoming more and more important factor in their ranking algorithm. Great Post!! Thanks for Sharing and waiting for new updates!! Great Post. Very informative article. Great post. It is truly help to us. Its give us heaps of interest and delight. Its truly a decent article. Great information..In current time people are more phone addict than laptop or pc’s.They can easily shop online using e-commerce website apps. In this world of many Mobile App Development sellers who are constantly trying to offer different tips on the latest Android app development are not appropriate to many. Keeping an eye on our website for all your Mobile App Development and Windows app development trends will help you grow. Mobile eCommerce services is very useful to online shopping. Thanks for sharing such nice information. The blog was absolutely fantastic!